Titanium dioxide (TiO2) is widely used as an inorganic UV-filter in cosmetic products; however, it has been classified as possibly carcinogenic to humans. While numerous studies demonstrated cytotoxic and genotoxic effects of nano-sized TiO2 in different cell lines, including human skin cells, studies investigating the effects of micro-TiO2 on human keratinocytes and melanocytes, in healthy and cancer cells, are scarce. Adenosine triphosphate (ATP) binding cassette subfamily B member 5 (ABCB5) is a plasma membrane protein known for its role in the tumorigenicity, progression, and recurrence of melanoma. Here, we investigated the effect of micro-TiO2 (average particle size ≤5 µm) on the metabolic activity, cytotoxicity and ABCB5 mRNA expression in metastatic melanoma cells. Metastatic melanoma cell line WM-266-4 was treated with different concentrations of micro-TiO2 for different incubation times to obtain dose- and time-dependent responses. Untreated WM-266-4 cells, cultured under the same conditions, were used as control. The cell metabolic activity was determined by MTT assay. Cytotoxicity of micro-TiO2 was analyzed by lactate dehydrogenase (LDH) cytotoxicity assay. The ABCB5 mRNA expression in melanoma cells was analyzed using quantitative reverse transcription polymerase chain reaction (RT-qPCR). After 120 hours of exposure to micro-TiO2 the metabolic activity of melanoma cells decreased, especially at the two highest micro-TiO2 concentrations. Comparably, the cytotoxicity of micro-TiO2 on melanoma cells increased after 48 and 120 hours of exposure, in a time-dependent manner. The ABCB5 mRNA expression in micro-TiO2-treated melanoma cells also decreased significantly after 24 and 48 hours, in a time-dependent manner. Overall, our results suggest inhibitory effects of micro-TiO2 on the metabolic activity and ABCB5 mRNA expression in metastatic melanoma cells, indicating its potential use as an anticancer agent. Scalia S, Mezzena M. Incorporation in lipid microparticles of the UVA filter, butyl methoxydibenzoylmethane combined with the UVB filter, octocrylene: Effect on photostability. AAPS PharmSciTech 2009;10(2):384-90. https://doi.org/10.1208/s12249-009-9217-2. Sánchez Rodríguez A, Rodrigo Sanz M, Betancort Rodríguez JR. Occurrence of eight UV filters in beaches of Gran Canaria (Canary Islands). An approach to environmental risk assessment. Chemosphere 2015;131:85-90. https://doi.org/10.1016/j.chemosphere.2015.02.054. da Silva CP, Emídio ES, de Marchi MRR. The occurrence of UV filters in natural and drinking water in São Paulo State (Brazil). Environ Sci Pollut Res Int 2015;22(24):19706-15. https://doi.org/10.1007/s11356-015-5174-3. Šikić Pogačar M, Mičetić-Turk D. Vitamin D in human health. Acta Medico-Biotechnica;10(1):12-24. Odio MR, Azri-Meehan S, Robison SH, Kraus AL. Evaluation of subchronic (13 week), reproductive, and in vitro genetic toxicity potential of 2-ethylhexyl-2-cyano-3,3-diphenyl acrylate (Octocrylene). Fundam Appl Toxicol 1994;22(3):355-68. https://doi.org/10.1006/faat.1994.1041. Bens G. Sunscreens. Adv Exp Med Biol 2014;810:429-63. Maier T, Korting HC. Sunscreens - which and what for? Skin Pharmacol Physiol 2005;18(6):253-62. https://doi.org/10.1159/000087606. Smijs T, Pavel S. A Case Study: Nano-sized titanium dioxide in sunscreens. In: Dolez PI, editor. Nanoengineering: Global Approaches to Health and Safety Issues. Amsterdam: Elsevier; 2015. p. 375-423. https://doi.org/10.1016/B978-0-444-62747-6.00013-0. Wang SQ, Balagula Y, Osterwalder U. Photoprotection: A review of the current and future technologies. Dermatol Ther 2010;23(1):31-47. Hamilton RF, Wu N, Porter D, Buford M, Wolfarth M, Holian A. Particle length-dependent titanium dioxide nanomaterials toxicity and bioactivity. Part Fibre Toxicol 2009;6:35. https://doi.org/10.1186/1743-8977-6-35. Borm PJA, Robbins D, Haubold S, Kuhlbusch T, Fissan H, Donaldson K, et al. The potential risks of nanomaterials: A review carried out for ECETOC. Part Fibre Toxicol 2006;3:11. https://doi.org/10.1186/1743-8977-3-11. Hext PM, Tomenson JA, Thompson P. Titanium dioxide: Inhalation toxicology and epidemiology. Ann Occup Hyg 2005;49(6):461-72. https://doi.org/10.1093/annhyg/mei012. Krause M, Klit A, Blomberg Jensen M, Søeborg T, Frederiksen H, Schlumpf M, et al. Sunscreens: Are they beneficial for health? An overview of endocrine disrupting properties of UV-filters. Int J Androl 2012;35(3):424-36. https://doi.org/10.1111/j.1365-2605.2012.01280.x. Trouiller B, Reliene R, Westbrook A, Solaimani P, Schiestl RH. Titanium dioxide nanoparticles induce DNA damage and genetic instability in vivo in mice. Cancer Res 2009;69(22):8784-9. https://doi.org/10.1158/0008-5472.CAN-09-2496. Guichard Y, Schmit J, Darne C, Gaté L, Goutet M, Rousset D, et al. Cytotoxicity and genotoxicity of nanosized and microsized titanium dioxide and iron oxide particles in Syrian hamster embryo cells. Ann Occup Hyg 2012;56(5):631-44. https://doi.org/10.1093/annhyg/mes006. Sycheva LP, Zhurkov VS, Iurchenko VV, Daugel-Dauge NO, Kovalenko MA, Krivtsova EK, et al. Investigation of genotoxic and cytotoxic effects of micro- and nanosized titanium dioxide in six organs of mice in vivo. Mutat Res Toxicol Environ Mutagen 2011;726(1):8-14. https://doi.org/10.1016/j.mrgentox.2011.07.010. Proquin H, Rodríguez-Ibarra C, Moonen CGJ, Urrutia Ortega IM, Briedé JJ, de Kok TM, et al. Titanium dioxide food additive (E171) induces ROS formation and genotoxicity: Contribution of micro and nano-sized fractions. Mutagenesis 2017;32(1):139-49. https://doi.org/10.1093/mutage/gew051. Kiss B, Bíró T, Czifra G, Tóth BI, Kertész Z, Szikszai Z, et al. Investigation of micronized titanium dioxide penetration in human skin xenografts and its effect on cellular functions of human skin-derived cells. Exp Dermatol 2008;17(8):659-67. Frank NY, Margaryan A, Huang Y, Schatton T, Waaga-Gasser AM, Gasser M, et al. ABCB5-mediated doxorubicin transport and chemoresistance in human malignant melanoma. Cancer Res 2005;65(10):4320-33. https://doi.org/10.1158/0008-5472.CAN-04-3327. Ma J, Lin JY, Alloo A, Wilson BJ, Schatton T, Zhan Q, et al. Isolation of tumorigenic circulating melanoma cells. Biochem Biophys Res Commun 2010;402(4):711-7. https://doi.org/10.1016/j.bbrc.2010.10.091. Volpicelli ER, Lezcano C, Zhan Q, Girouard SD, Kindelberger DW, Frank MH, et al. The multidrug-resistance transporter ABCB5 is expressed in human placenta. Int J Gynecol Pathol 2014;33(1):45-51. https://doi.org/10.1097/PGP.0b013e31829c677f. Schatton T, Frank MH. Cancer stem cells and human malignant melanoma. Pigment Cell Melanoma Res 2008;21(1):39-55. https://doi.org/10.1111/j.1755-148X.2007.00427.x. Chartrain M, Riond J, Stennevin A, Vandenberghe I, Gomes B, Lamant L, et al. Melanoma chemotherapy leads to the selection of ABCB5-expressing cells. PLoS One 2012;7(5):e36762. https://doi.org/10.1371/journal.pone.0036762. Czyz M, Koprowska K, Sztiller-Sikorska M. Parthenolide reduces the frequency of ABCB5-positive cells and clonogenic capacity of melanoma cells from anchorage independent melanospheres. Cancer Biol Ther 2013;14(2):135-45. https://doi.org/10.4161/cbt.22952. Lakhter AJ, Sahu RP, Sun Y, Kaufmann WK, Androphy EJ, Travers JB, et al. Chloroquine promotes apoptosis in melanoma cells by inhibiting BH3 domain-mediated PUMA degradation. J Invest Dermatol 2013;133(9):2247-54. https://doi.org/10.1038/jid.2013.56. Qiao S, Tao S, Rojo de la Vega M, Park SL, Vonderfecht AA, Jacobs SL, et al. The antimalarial amodiaquine causes autophagic-lysosomal and proliferative blockade sensitizing human melanoma cells to starvation- and chemotherapy-induced cell death. Autophagy 2013;9(12):2087-102. https://doi.org/10.4161/auto.26506. Zdravković B, Prunk Zdravković T, Zdravković M, Štrukelj B, Ferk P. The influence of nano-TiO2 on metabolic activity, cytotoxicity and ABCB5 mRNA expression in metastatic melanoma cells. J BUON Off J Balk Union Oncol BUON 2018;23(5) [in press]. Skocaj M, Filipic M, Petkovic J, Novak S. Titanium dioxide in our everyday life; is it safe? Radiol Oncol 2011;45(4):227-47. https://doi.org/10.2478/v10019-011-0037-0. Gao X, Wang Y, Peng S, Yue B, Fan C, Chen W, et al. Comparative toxicities of bismuth oxybromide and titanium dioxide exposure on human skin keratinocyte cells. Chemosphere 2015;135:83-93. https://doi.org/10.1016/j.chemosphere.2015.03.075. Xue C, Wu J, Lan F, Liu W, Yang X, Zeng F, et al. Nano titanium dioxide induces the generation of ROS and potential damage in HaCaT cells under UVA irradiation. 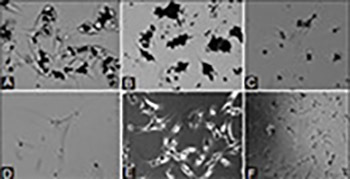 J Nanosci Nanotechnol 2010;10(12):8500-7. https://doi.org/10.1166/jnn.2010.2682. Frenzilli G, Bernardeschi M, Guidi P, Scarcelli V, Lucchesi P, Marsili L, et al. Effects of in vitro exposure to titanium dioxide on DNA integrity of bottlenose dolphin (Tursiops truncatus) fibroblasts and leukocytes. Mar Environ Res 2014;100:68-73. https://doi.org/10.1016/j.marenvres.2014.01.002. Jacobs JF, van de Poel I, Osseweijer P. Sunscreens with titanium dioxide (TiO(2)) nano-particles: A societal experiment. Nanoethics 2010;4(2):103-13. Murphy GF, Wilson BJ, Girouard SD, Frank NY, Frank MH. Stem cells and targeted approaches to melanoma cure. Mol Aspects Med 2014;0:33-49. https://doi.org/10.1016/j.mam.2013.10.003. Reid AL, Millward M, Pearce R, Lee M, Frank MH, Ireland A, et al. Markers of circulating tumour cells in the peripheral blood of patients with melanoma correlate with disease recurrence and progression. Br J Dermatol 2013;168(1):85-92. https://doi.org/10.1111/bjd.12057. Gray ES, Reid AL, Bowyer S, Calapre L, Siew K, Pearce R, et al. Circulating melanoma cell subpopulations: Their heterogeneity and differential responses to treatment. J Invest Dermatol 2015;135(8):2040-8. https://doi.org/10.1038/jid.2015.127. Gambichler T, Petig A-L, Stockfleth E, Stücker M. Expression of SOX10, ABCB5 and CD271 in melanocytic lesions and correlation with survival data of patients with melanoma. Clin Exp Dermatol 2016;41(7):709-16. https://doi.org/10.1111/ced.12928.